The CPBL has announced the five teams that will participate in the 2018 Asia Winter Baseball League. 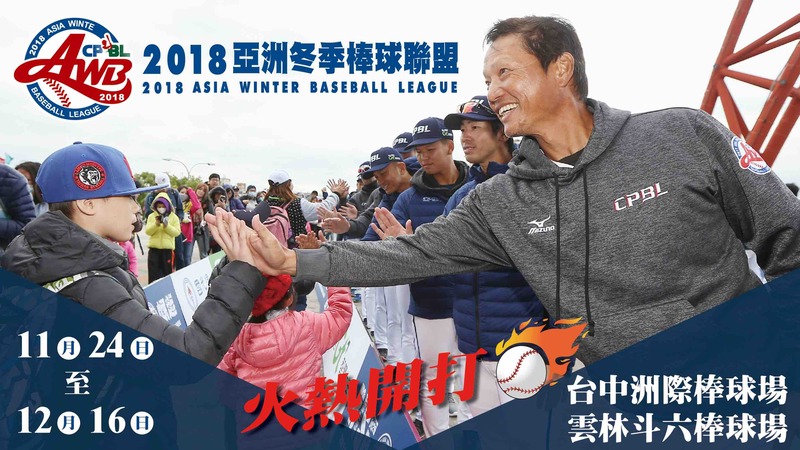 Returning for the sixth season, the CPBL winter league will feature teams from Taiwan (1), Japan (3) and Korea (1). From November 24 to December 16, prospects from the CPBL, NPB and the KBO will gather in Taiwan to further develop themselves during the off-season. Each team will play 16 games during the three weeks period. Japan: JABA All-Star (Industrial League). According to the Team CPBL manager, the formation of the CPBL squad is same as last season. The management team will select the young players that they think have the opportunity to make it to the first team in the future. The EU All-Star and the WBSC All-Star will not return for the 2018 season, the league, however, did not disclosed the reasoning behind it. Did Po Jung Wang ever participate in this league? The winter league took 2014 off due to funding issue. So, Wang Po-Jung did not participate, or otherwise he will probably played for the Taiwan junior national team that year in the CPBL winter league. FYI, both Darin Downs and Zack Segovia pitched effectively in the Mexican League’s second half after getting released by their CPBL teams. Yeah, been following Zack Segovia on Facebook. It’s good to see him doing well after CPBL. I think both of them met each other too at one point.